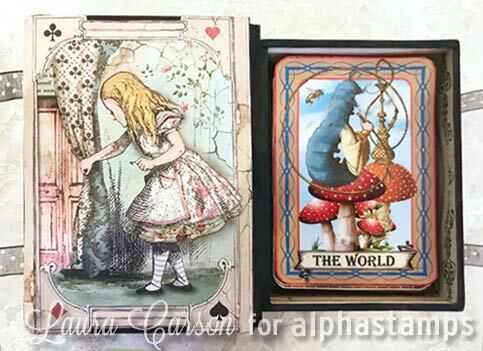 ﻿	Alpha Stamps News » Alice Tarot Deck by Laura Carson; Birds & Bees SALE! Alice Tarot Deck by Laura Carson; Birds & Bees SALE! Ooh! This is so fabulous! Laura has created all the cards (at least the 22 Major Arcana) for an Alice in Wonderland Tarot Deck! Laura had made a couple cards in a similar style ages ago, but after much pleading (by you all) she’s created a collage sheet set (or a digital download set) so you can make the cards yourself! The cards can fit inside the ATC Sized Faux Book Box. And with the New Alice Scrapbook Papers (more info below), decorating both the outside and inside of that box in a matching style is so easy! Here’s a link to all the supplies Laura used. AND Laura provides a step-by-step tutorial on how she made the tarot deck! Laura also made a mini version of the tarot deck using her new Mini Alice Tarot Collage Sheet! The sheet includes all of the images from the 3 Alice Tarot Collage Sheet set (22 Major Arcana tarot cards) featuring characters from “Alice in Wonderland” and “Through the Looking Glass” books plus some images to decorate a card box. This set fits perfectly in the Tiny Card Faux Book Box. And through midnight Saturday night (April 13, 2019) you can get a free digital download of the Mini Alice Tarot Collage Sheet (shown at right)! Here’s how it works: buy one of the Faux Book Box Tiny Card Size (that these cards were made to fit) and if you also put the digital version of the Mini Alice Tarot Collage Sheet in your cart, when you check out it will be FREE! See the screenshot from my cart at left for an example of how it works… no coupons to enter… easy as pie. Ah… the stars have finally aligned and some papers I order WITH the Hearts & Clubs Card Suits Scrapbook Paper that’s in the Alice Accordion Book Kit are here! Lots of BIRDS are Back in Stock! Here’s a link to everything new or back in stock today (just a few highlighted below). It just happens to include a lot of birds (nests, eggs, cages) so read on cuz there’s a related sale! ALL Birds & Bees ON SALE – 30% off! This is a big group: 88 items, including all those back in stock items I just mentioned! The sale ends at midnight TOMORROW NIGHT, April 12th. I’ve picked out just FOUR items from Laura’s supply list, but oh what four! To enter the Alice Tarot Deck Giveaway drawing all you have to do is leave a comment BELOW on this blog post TODAY or TOMORROW (the deadline is 11:59 pm PST, Friday Night, April 12, 2019). Hey, who won The Tweedles Giveaway from Sunday’s newsletter? That would be Jaimi B! Congrats! Check your email for info. April 11th, 2019 at 8:35 am. So clever tarot decks are beautiful and this one is something different. April 11th, 2019 at 8:42 am. Beautiful and awesome! I adore the whole Alice thing and that Alpha Stamps can feed my love. April 11th, 2019 at 8:45 am. Alice is so cool. I would like to make an Alice paper doll. April 11th, 2019 at 8:46 am. I would have a “drink me” bottle included in the box. April 11th, 2019 at 8:50 am. I love tarot cards. These are super cool! Not all of us can be Alice like an out of context Alice. Make sure you purchase the correct blonde hair color at Avon… Last I new that toy tarot was gypsy related, and not British related. Looks like a fun set to play with. Thanks for the inspiration. April 11th, 2019 at 8:54 am. April 11th, 2019 at 8:58 am. April 11th, 2019 at 9:01 am. April 11th, 2019 at 9:09 am. Alice is fun and enchanting. Love her. April 11th, 2019 at 9:19 am. I love Tarot cards in any theme, but an Alice theme is fantastic! April 11th, 2019 at 9:37 am. I love that new paper set! I would certainly make more Alice projects as I love everything Alice! April 11th, 2019 at 9:41 am. April 11th, 2019 at 9:45 am. The Alice paper could be used for so many projects. April 11th, 2019 at 9:52 am. OMG…..count me in. How adorable is all this goodness. Tarot cards, what a concept and so well designed. April 11th, 2019 at 9:59 am. Alice and Tarot? Inspiration to make my own! April 11th, 2019 at 10:12 am. Like the classic Alice…probably make a Cheshire cat and Alice box scene. April 11th, 2019 at 10:13 am. I love Alice! I’m in the process of making my Niece a mad hatter hat/giftbox that is bought the SVG from DreamingTree. these papers would be perfect for the junk journal that will be inside the gift box! April 11th, 2019 at 10:22 am. April 11th, 2019 at 10:28 am. Crazy for Alice and all her wonderland adventures! April 11th, 2019 at 10:30 am. April 11th, 2019 at 10:43 am. Alice and Tarot, what a perfect combination. I will be making a deck. April 11th, 2019 at 11:24 am. oh lordy – luv those tarot cards ! April 11th, 2019 at 11:31 am. Omg omg omg! Love those papers! April 11th, 2019 at 11:37 am. Such fun papers! Loving the cards! April 11th, 2019 at 11:40 am. oh oh oh this is the best ever!! I will be making an oracle deck and I’m pretty sure I need one in each size! April 11th, 2019 at 11:53 am. April 11th, 2019 at 12:01 pm. April 11th, 2019 at 12:16 pm. April 11th, 2019 at 12:34 pm. April 11th, 2019 at 12:39 pm. The Alice papers are gorgeous! April 11th, 2019 at 1:15 pm. I am a huge Alice fan!! I love ❤️ Alice everything would be a nicely added surprise for the rest of my Alice items!!! April 11th, 2019 at 1:18 pm. Oh goodness, these are too cute for words! April 11th, 2019 at 1:47 pm. I would love to make these for my friend who is retiring and loves Alice in Wonderland! April 11th, 2019 at 2:48 pm. What a wonderful giveaway. I’d be making LOTS of ATCs! April 11th, 2019 at 3:51 pm. Every year I look forward to a Alice project. This is it for this year. Cannot wait to get started! April 11th, 2019 at 4:04 pm. Oh! Tweedle Dee and Tweedle Dum…Grandbaby and I will flip through the cards to find our fabulous fortune and create a wonderful little box for these treasures! April 11th, 2019 at 4:30 pm. Love love the tarot cards!!! I would have to make some Alice in wonderland birthday cards!!! April 11th, 2019 at 4:56 pm. The tarot cards and the little book are sweet. What a cute little project. April 11th, 2019 at 5:41 pm. I love the cards! I like making collage gift boxes and I would love to use these pictures. April 11th, 2019 at 6:17 pm. April 11th, 2019 at 6:40 pm. Yes to making the Alice Tarot Cards…I wonder how deep into Wonderland I will fall this time?? Laura this is inspired and Gorgeous as always!! April 11th, 2019 at 6:44 pm. Said it before, but remains true… Alice has always been my favorite. Crossing my fingers! April 11th, 2019 at 7:26 pm. April 11th, 2019 at 8:07 pm. OMG – so cute! I’d make folders and dashboards for my travelers notebook, but only after I made the Tarot. April 11th, 2019 at 8:33 pm. April 12th, 2019 at 12:03 am. April 12th, 2019 at 4:23 am. After making the tarot deck I would use the leftover paper to make a tin or box to store them in. April 12th, 2019 at 4:45 am. Love this idea! Thanks Laura! I will make the Tarot Cards. April 12th, 2019 at 4:57 am. the mini deck would go great with the gypsy wagon or the gypsy tent I made. April 12th, 2019 at 7:02 am. What great inspiration! I would love to make the Tarot as my Halloween cards this year. Thanks for continuing to inspire us Alpha Stamps & Ms. Carson! April 12th, 2019 at 7:03 am. What fun! I love everything Alice! I’d love the tarot cards, and then I’d make a memory book with some pics of us at the Disneyland Alice in Wonderland ride! April 12th, 2019 at 8:33 am. What a wonderful set! I love Alice! April 12th, 2019 at 9:08 am. I would make jewelry. I’ve gotten other digital files from Alpha Stamps and have made tiny little shadowbox charms that are soldered. I hope I win, I have lots of great ideas in mind. April 12th, 2019 at 9:43 am. Tarot and Alice…I’m giddy with excitement! April 12th, 2019 at 6:21 pm. Love this kit. I know just the person who would love to be the recipient! April 12th, 2019 at 6:58 pm. What a neat kit! I would decorate my blank journal covers and make Wonderland-ish greeting cards once I finished my tarot deck. April 12th, 2019 at 7:20 pm.